Wouldn’t it be fun to grow up drawing on walls and painting windows? Well, I’m telling you now: go ahead and paint the windows! 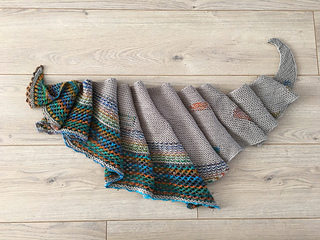 Using a very simple technique (just knit the two yarns together - it’s not intarsia) you get to paint twelve differently shaped windows as brightly as you like or with your favorite colors. 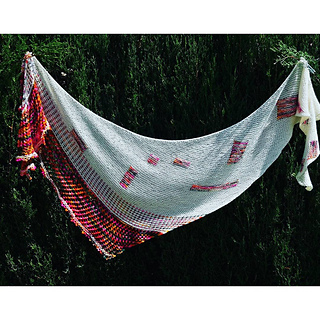 The entire shawl is quite simple and designed to show off the various graphic windowpanes (with a few slipped stitches, eyelets and picots at the end to compliment the windows.) As we say in New England, this one is wicked easy! Color advice You really need the brighter or variegated color on the windows. 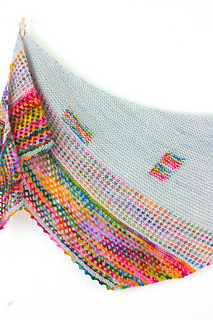 In my shawl, a variegated background with silver windows did not show any windows at all. 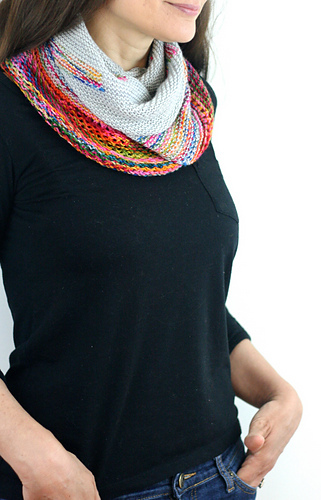 Shown in Miss Babs Yummy 2-Ply in Quicksilver and Mad Hatter. 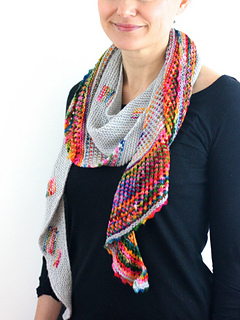 This pattern requires one skein (400 yards) of each color and they are used equally. Nothing is stopping you, however, from using scraps for the windows. 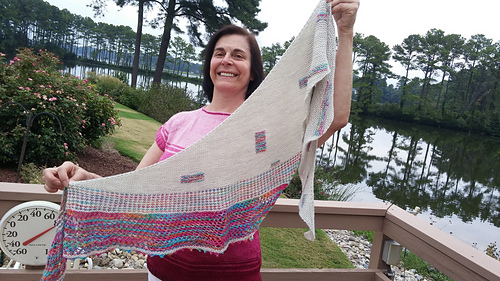 The final two photos show the reverse side of the shawl. Do you have color combinations that you want to run by someone? Start a thread in the Casapinka group and we’ll give you feedback. You may choose any brand of yarn that you like.